On Friday, August Natural opened up around $0.03 and the market looked to be in rally mode coming out of the overnight session. As soon as the opening bell sounded, however, August dropped around a nickel and spent the next half hour clawing its way back to the opening range. From there, prices moved in a $0.04 range on one of the quietest trading days we’ve seen in a while. There is an uneasy feeling in the market, although it’s not supported by the chart analysis in the purest sense, that Natural Gas is over-bought at these levels. The bulls would love to see that $3-handle on a daily closing price, but nobody seems to believe that prices can stay there for any length of time. Last week’s storage report should serve as a cautionary indicator of what can happen to the supply/demand balance when prices are too high. This morning in Globex, Natural Gas is almost unchanged, Crude Oil is down around $0.35, Heating Oil is up around half a cent and Gasoline is up around a penny. Northeast city gate cash markets were strong on Friday. The market was anticipating very strong power generation burn over the weekend, with temperatures forecast to be in the 90’s for most of the region. 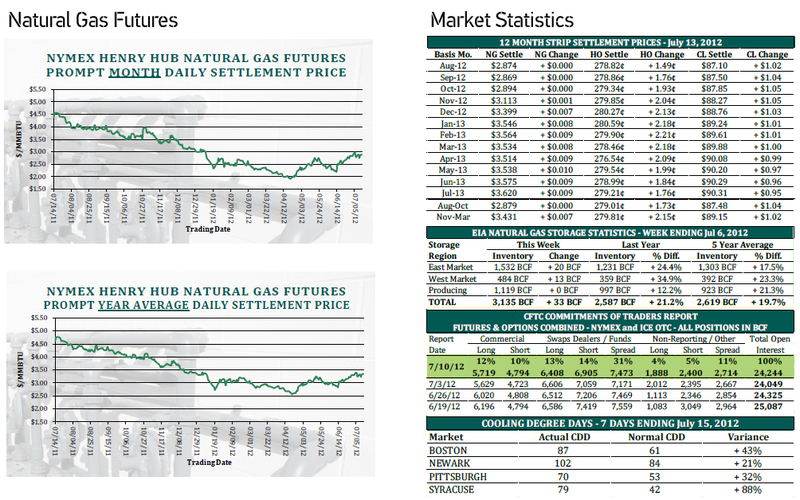 New England markets were up $0.35 to $0.40 while Mid-Atlantic markets were up around $0.08.